Until very recently, the iPad mini has been the stuff of legend. Bigfoot, lost-city-of-Atlantis, unicorn style legend. But no more - the iPad mini is finally real, as CEO Tim Cook has unveiled the slightly smaller Apple tablet on stage. Some Thoughts: We expected a pretty huge design refresh. Jony Ive said in the video that there is inherent loss in just shrinking a product. All software for original iPad works on iPad mini because they share the same screen resolution. 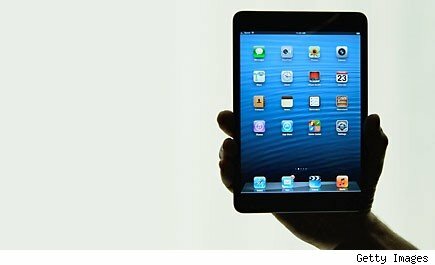 Phil Schiller pit the iPad mini against the Nexus 7 on stage, and showed that the display is actually 49 percent larger in portrait, and 67 percent larger in landscape. That has to do with a new design that makes the bezels much smaller than we've seen on the larger iPad models. Schiller showed off Yelp!, eBay and Pandora apps on both tablets, showing the difference between apps developed specifically for a tablet as opposed to apps that have been stretched from a smartphone. Most of the parts you're seeing above are included in the iPhone 4S. They're components that Apple has already been sourcing from various manufacturers, meaning they're much easier to procure this time around. By retooling the same components for the iPad Mini, Apple is likely cutting costs. The iPad isn't great for taking pictures. It's just too big. But the iPad Mini will be even more portable than its big brother, and perhaps a bit more wieldy, too. The new iPod touch is clearly trying to replace the average digital point-and-shoot camera, and the iPad mini is to the iPad as the iPod touch is to the iPhone 5. Attention to camera capabilities may be a nice counter to the lower-grade specs. The iPad mini goes up for pre-order on October 26, and Wifi versions ship on November 2.